Snake In The Eagle’s Shadow represents a turning point in the career of Jackie Chan; he was deemed a failure by Lo Wei after several box office disappointments. The heir to Bruce Lee he was most definitely not; just another stuntman who couldn’t cut the mustard as a star. So when Golden Harvest came calling, Lo Wei had no qualms about lending Jackie to them. Jackie, understanding that the end was near, asked to control his own films, and to do something no one had really thought of: allowing Jackie to be Jackie, and not Bruce. 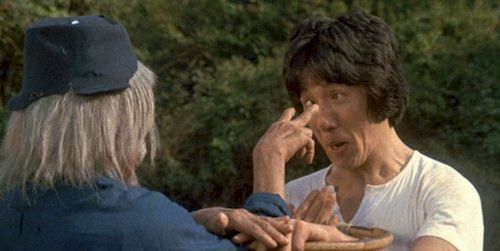 That thinking, along with pulling JC into the orbit of the Yuen family, culminated in this film, which would become the thematic template to the film that will make Jackie Chan a major star, Drunken Master. So what to make of the Snake? Snake in the Eagle’s Shadow really shows the comedy that would become a hallmark of Jackie’s early films and career as a whole. Jackie himself, at least this time, is playing a nice young man, rather than the rapscallions he would later play. Even in this early film, it’s easy to see why JC became the superstar that he is. He has a great screen presence, and his kung fu is fun to watch, especially since he fell under the wing of the Yuen family, Speaking of whom, Simon Yuen, the real ODB himself, is as crazy fun to watch as he ever was. Is there any doubt that Simon Yuen was to Jackie Chan in these early films what Bill Tung would be for his later ones? They were both great comedic foils for JC to play off of, and they are both sorely missed. 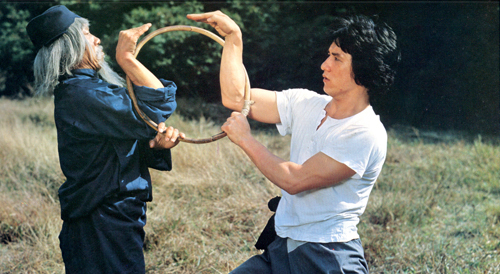 Hwang Jang Lee is just awesome, this being a warm-up (as it was for everyone) for his role in Drunken Master. Roy Horan is decent as one of the assassins, and his finale…damn! The story itself is simple but hey, that’s the novel joy of it, and Yuen Woo Ping keeps things moving at a brisk pace, and the training sequences are standout, as is the scene where JC finally practices the Snake Fist form. Still glad to see films where the hero is not an instant badass who is a kung fu expert right out of the womb. This film also answers a trivia question “what’s the worst kill of Jackie Chan’s career?” Roy Horan gets the nod here, and his death by skewered testicles ranks up there with some of the worst as JC just pulls a Sonny Chiba on his unfortunate ballsack. I can’t decide if Horan’s death scene is one of the worst acted or one of the best. It’s just that cruel an ending for him. He could’ve screamed for his mommy at the point and I wouldn’t have blamed him. The fights are as imaginative as Woo Ping has ever been, but is only a small taste for what’s to come. The final fight with Hwang Jang Lee, Jackie Chan, and Simon Yuen is as great as you would think, but still only a small, small taste of what’s to come. Woo Ping brings out the playfulness in JC, and that’s the thing I think Woo Ping does so well; he matches his fight choreography to the personalities of the actor/fighter. A great kung-fu film that became Jackie Chan’s first real hit film, and would set the stage for one of the greatest kung fu films of all time! A fun filled spectacle to watch. Previous Kiai-Kick’s Q & A with Jean-Claude Van Damme! Next Luc Besson Brings Us Warriors Gate!